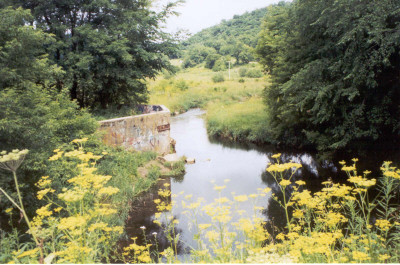 A trout stream in Winnebago Valley. Winnebago Township is the second from the Mississippi on the southern border of the county and state. It has Mayville on the north, Jefferson on the east, Allamakee County, Iowa on the south and named for the Winnebago Indians who frequented teh region earlier. The first settler was Freeman Graves. Other early settlers were Beman, Sherman, Perry, Salisbury, Monk, Schapper, Rhug, Carston, Meyus, Barry, Walsh, Sheehan, McCarthy, Tippery Bros., Eaton, Bommer, Coe, Doty and the five Hanson Bros., from Norway. The organizational meeting was held on May 1858 at the house of E. Laflin. The following were elected: Supervisors, Joseph Melvin, Fred Kohlmeier and Edmund Lynch; Clerk, Lovel Houghton; Assessor, Lark Laflin; Collector Harvey Jones; Overseer of the Poor, John Tourtelotte; Justices of the Peace, Asa Beman, Herman Cartson; Constables Frederick Ruhe and James Templton; Overseer of Roads, Freeman Graves. The 1982 officers are: Clerk, Rodney Meiners, Treasurer, LaVern Meiners; Chairperson, Donald Kruse; Supervisors, Harold Meyer and Frank Gerardy. Assessor Garland Moe. Submitted by Houston Co. Historical Soceity Comm.